Titanfall still is one of the most fun and intense gaming experiences I’ve had, and every titan I drop in to battle feels like the first. It should be no surprise that I am also hyped for the sequel. 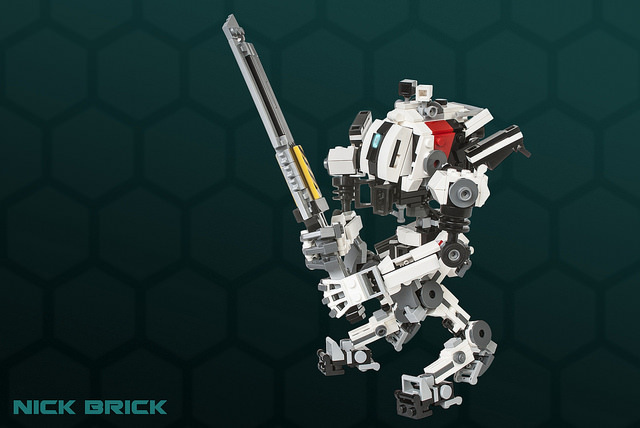 Several new titan types have been designed for Titanfall 2, and of the titans revealed thus far, the sword-wielding Ronin Titan stood out to me as a good idea for a LEGO build. There were a couple challenges in this approximately 8-hour build. The first challenge was constructing the titan sturdy enough to stand up on its own. The Ronin frame is lightweight and fast, which called for many thin connections. Fairly new ball and socket joints worked for most of these connections, but they don’t have enough friction to support the cockpit. I used LEGO string pieces as wire detail underneath the cockpit, but the tension in the string also prevents the cockpit from tipping forward. The other challenge was capturing the details right from limited reference material. Watching the Ronin reveal trailer frame-by-frame, and the single reference image shown on the official Titanfall website, were all I had to work with. Some details weren’t even possible to figure out, like the entire reactor on the rear of the cockpit and the thrusters on the shoulders. On these areas, I looked back at the three titan frames from the original Titanfall to create a reactor and thrusters that fit the Titanfall aesthetic and looked somewhat like the blurry details in the trailer. View the photos on my Flickr.